The Ohio Assessments for Educators is a suite of exams for certifying applicants to teach in the state of Ohio. The Educational Leadership exam is one of the required parts of the process of becoming a licensed administrator. So all those seeking a career as a principle, superintendent, curriculum developer, educational researcher or other educational administrative professional will first need to successfully pass this exam. Prepare with our OAE Educational Leadership Exam Study Guide and Practice Questions. Print or eBook. Guaranteed to raise your score. Get started today! When Should I Register for the OAE Educational Leadership Exam? The exam is offered year round so you can choose a testing date that fits best with your schedule and your needs. However, to ensure you can get the perfect testing date, you should register as far in advance as possible, ideally about three to four months before the date you want. This will also have the benefit of giving you as much time as possible to prepare for the exam. Understanding the role and intersections of social, political, economic, cultural, legal, and ethical dimensions in successful education of diverse students. Advocating for and nurturing a positive learning environment and culture that promotes high standards and success for diverse students. Effective teaching practices and the application of instructional leadership. Professional development strategies that nurture lifelong learning for faculty, staff and yourself. Organizational management and its application in creating learning systems that are both positive and productive. Nurturing a positive and productive learning system for a diverse group of students using effective human resource management strategies. Methods of operational management that contribute to a safe, effective, and efficient learning environment for every student. Effective management of fiscal and material resources in order to create an effective and efficient learning system. Understand the legal and ethical dimensions of educational leadership. For each of the constructed response prompts, you will be expected to write somewhere between 150 and 300 words that demonstrate your ability to engage with the content you were tested on in the multiple choice question. How well your response achieves the purpose of the assignment. How accurately and effectively your response applies the relevant content knowledge and skills. How relevant and specific the supporting points you used are. Effective use of sound reasoning. The exam is given a scaled score ranging from 100 to 300. You need to score at least 220 in order to successfully pass this exam for certification purposes. You’ll be able to access your score report to find out whether or not you passed within about two to three weeks of completing your exam. 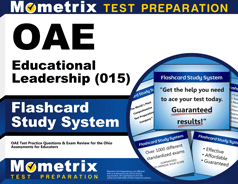 OAE Educational Leadership Flashcards. Proven to raise your score on the OAE test. Guaranteed. 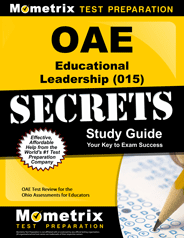 What’s the Best Way to Study for the OAE Educational Leadership Exam? This is a rigorous exam that will require more than simply memorizing a set of facts. Nearly half (40%) of your score depends on your ability to write clear, cohesive, and thorough responses to prompts that will ask you to integrate your knowledge and understanding from a variety of categories. That means you should spend at least three or four weeks not only reviewing the material but working on your ability to apply that knowledge to the kinds of problems and cases that the exam will present you with. A great way to do that is with the Mometrix Study Guide. In addition to the comprehensive overview of the material, the guide also includes practice questions that will allow you to strengthen your ability to synthesize and apply that material to exactly the same kind of questions and prompts that you will see on test day. For further support, pick up the Mometrix Flashcards. Flashcards offer a more engaging and interactive way to study so that you’re not just passively absorbing information but actively recalling and using it. Plus, the flashcards come with an extra set of sample questions for even more practice.